Dr. Anna Serur is one of few in NY metro area specializing in complex procedures using nerve sparing and organ function preservation techniques. January 4, 2017 – Dr. Anna Serur has been named chief of colon and rectal surgery at Englewood Hospital and Medical Center, effective January 1, 2017. Dr. Serur, a renowned surgeon with expertise in colorectal cancer and complex colorectal conditions, is one of only a handful of colorectal surgeons in the New York metropolitan area who performs minimally invasive pelvic procedures focused on nerve sparing and organ function preservation. Dr. Serur specializes in laparoscopic and robotic colorectal surgery, anorectal procedures and reoperative abdominal and pelvic surgery, including sphincter-sparing surgery and avoidance of permanent colostomy. These minimally invasive approaches use small incisions in combination with 3D high-definition imaging for enhanced vision and control, leading to a more precise and accurate procedure. Most recently, Dr. Serur was the director of colorectal surgery at Maimonides Medical Center in Brooklyn, New York, and an assistant professor at Hofstra University School of Medicine. 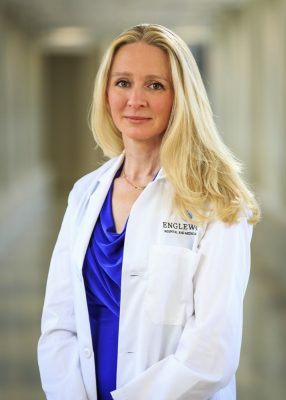 She received her medical degree from State University of New York-Downstate, completed her surgical residency at NewYork Presbyterian-Weill Cornell Medical Center and Memorial Sloan Kettering Cancer Center and then completed a fellowship at North Shore University Hospital in colon and rectal surgery. Dr. Serur has published multiple research manuscripts, written numerous book chapters, and presented at national and international conferences. She is a fellow of the American College of Surgeons and the American Society of Colon and Rectal Surgeons. Dr. Serur has been named a Top Doctor in the NY-Metro area by Castle Connolly and has been the recipient of several awards including the Outstanding Resident Achievement Award by the Society of Laparoendoscopic Surgeons. Dr. Serur is a member of MDPartners, the physician network of Englewood Hospital and Medical Center, and can be reached at 201-608-2800.